I spy, with my little blue eyes… an amazing community full of love, hope, concern and cheers. 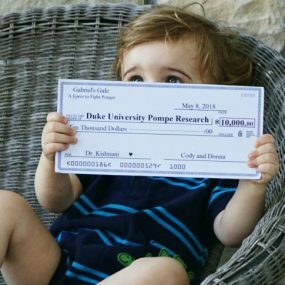 Because of you – whether it was kind words, prayers, donations of time or money – we are able to send this check from Gabriel’s Gale to Duke University for Pompe research! Below is part of a message from Dr. Priya Kishnanai and her team about what our donation will do for Pompe Warriors! Look for a progress update in September. And, please watch for an invitation to our next big Gabriel’s Gale fundraiser – spring of 2019! Pompe disease is a genetic disease resulting in glycogen build up primarily in skeletal, cardiac, and smooth muscle. Documented benefits of early diagnosis and treatment, paired with relentless efforts, led to addition of Pompe disease to the Recommended Uniform Screening Panel (RUSP) in 2015, by Dr. Priya Kishnani and her team at Duke University. Eight states are now screening for Pompe disease through newborn screening (NBS) which identifies both the classic infantile and late-onset forms, with several other states considering NBS expansion to include Pompe disease. NBS allows for the early detection of cases with late-onset Pompe disease (LOPD). The clinical presentation of LOPD is highly variable, with presentation from the first year to as late as the sixth decade of life. Without NBS, there is typically a long diagnostic odyssey of up to 20 years and significant involvement by the time these individuals are diagnosed. A current challenge for infants diagnosed with LOPD by NBS is the lack of uniform guidelines for management and treatment initiation. With funds partly from Gabriel’s Gale, our team at Duke University under Dr. Priya Kishnani will perform detailed clinical evaluations on these patients. These multi-disciplinary assessments will allow us to capture and describe the earlier clinical phenotype in patients and provide insights into the early signs and symptoms of LOPD. The study will provide an evidence-based approach to clinical management of newborns with LOPD to primary care physicians and geneticists, leading to improved patient outcomes.